As I've mentioned before, I'm not a huge fan of plain old caramel corn. But if you jazz it up a bit, I'll at least give it a try. And this product is sexified well beyond the status of standard snacking caramel corn. I'll admit, Sonia was way more excited about trying this than I was. To say I was skeptical would be an understatement. But this is possibly the best caramel corn I've ever had. It's still not my favorite style of junk food, but the flavor of this popcorn is really, really interesting. Both Sonia and I agree it tastes way more like coconut than mango. You kind of have to use your imagination to even detect mango flavor. Although, it just dawned on us that we're already going through some form of mango overload. We've both tried about six of these new mango products now—and we're worried that our taste buds require greater and greater doses of the tropical treat. A similar phenomenon occurs with pumpkin each fall. But this is week 1, year 1 of the mango madness marathon. Not sure if we can go the distance on this one if we're already requiring increased quantities of the juicy Asian stone fruit. But perhaps a more likely explanation is that this product simply doesn't taste that much like mango. And that's not a bad thing. The title of the product is a bit misleading, but we'll forgive Big Joe for that one. Because it's delicious anyway. The last product we reviewed was heavy on the mango, and not nearly as heavy as I would have liked it to be in the coconut department. Well, dear old Mr. Coconut has gotten his revenge with this caramel corn. 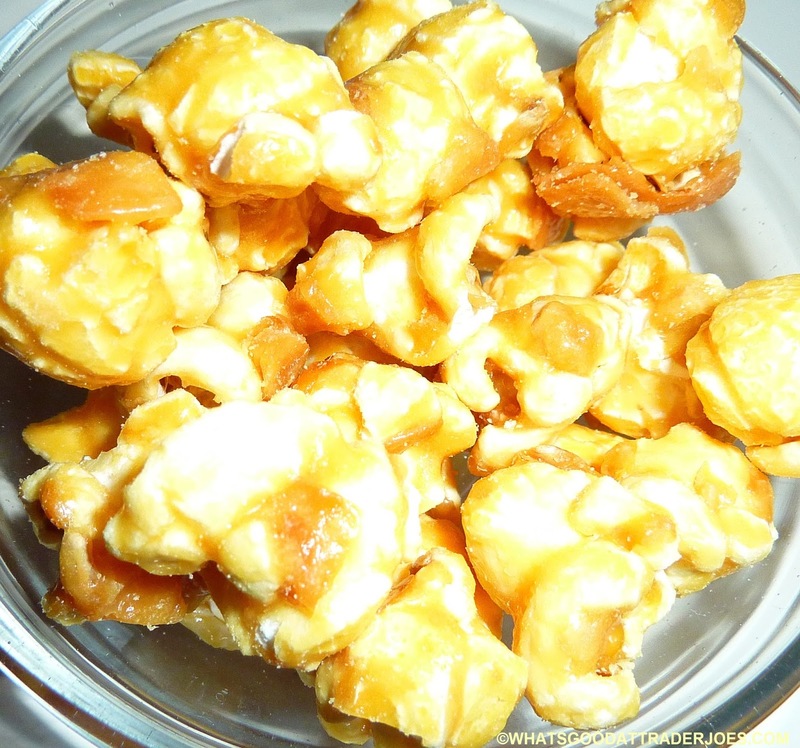 It's just like regular caramel corn, texture-wise, but it tastes just like coconut. There's still a good bit of that sweet, traditional, caramel flavor, too—but who'd have guessed it would blend so well with coconut flavor? In all seriousness, there is a whisper of mango as well, particularly at the finish. It's just very subtle. And that's all it needs to be here. 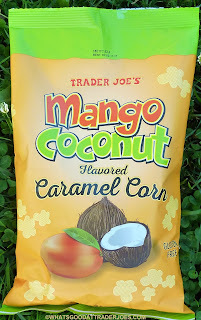 In summary, if you like caramel corn and coconut, this just might be your new favorite food. Four stars from me. Four and a half from Sonia. omg, and I commented on it!... sheesh.. btw they changed up the label... even the tj employee thought it was a new product!. Actually, they say the organic mango lemonade is a "start-from-scratch re-do of a lemonade we used to carry" & "the previous incarnation didn’t live up to our expectations." I guess we'll have to check out the new version too! 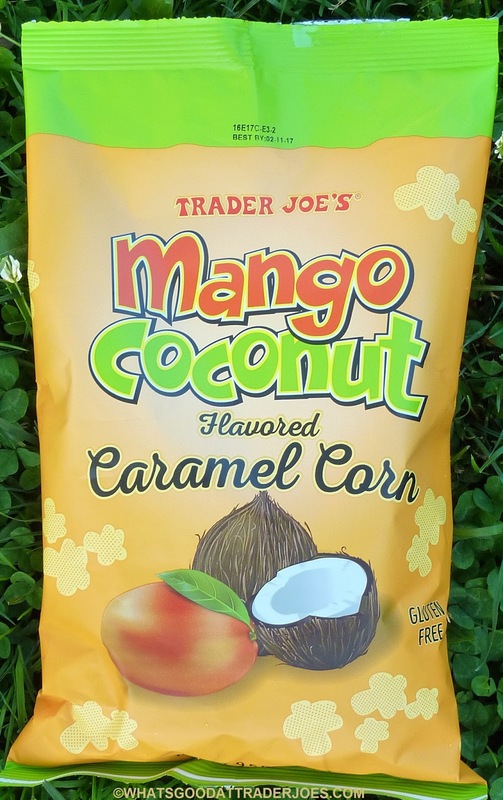 I agree my first thought as I tasted was oh caramel corn and then the coconut hit and I thought oh no this is dangerously good and I will eat the entire bag in one sitting if it goes in my cart! Lol- stop the mango madness.